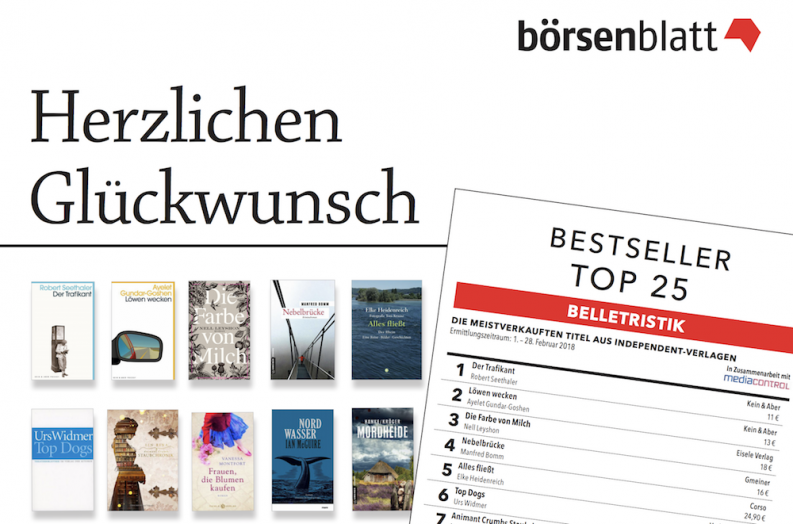 A new, monthly bestseller list from Germany highlights fiction titles from independent publishers. The February bestsellers include historical fiction, the latest in a detective series, and a number of translations. German publishing trade magazine Das Boersenblatt announced this week the launch of a new bestseller list exclusively for fiction titles from German-language, independent publishers. Updates will be published monthly, in cooperation with market research company Media Control GmbH. “Fiction titles from independent publishing houses don’t often have it easy, competing in the same market with titles from larger houses,” wrote the Boersenblatt in its announcement. The list will track fiction titles across print formats (hardcover, paperback, and mass market) and with a minimum list price of €8. Publishers that made less than €10 million in revenue in the previous year are eligible, and they must operate independently from other companies, foundations, or organizations. Released on March 14, the first of these monthly bestseller lists looks at February 2018 book sales from independent publishers. Publisher Kein & Aber takes the top two spots. The top-seller is Der Trafikant by Austrian author Robert Seethaler. 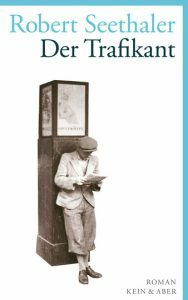 Published in 2013, the Boersenblatt reports that 520,000 copies have been sold so far, making this book “a true long-seller.” The story follows 17-year-old Franz, living in Vienna in 1937, and his unexpected friendship with Sigmund Freud. Seethaler’s 2008 novel Die weiteren Aussichten is also on the February list at No. 11. Israeli author Ayelet Gundar-Goshen’s 2016 novel, Löwen wecken (Waking Lions), takes the No. 2 spot. Translated from Hebrew by Ruth Achlama, the book begins as a rich neurosurgeon accidentally runs over an illegal immigrant and flees the scene. The book was published in the UK by Pushkin Press (March 2016) and in US by Little, Brown (March 2017). The Colour of Milk by Nell Layshon is third on the list, translated from English by Wibke Kuhn. Originally published in the UK by Penguin, the book gained international attention in France and Spain. In fourth place, Nebelbrücke is the 18th book in Manfred Bomm’s Commissar August Häberle series from Gmeiner Verlag. And German literary critic and television presenter Elke Heidenreich takes the No. 5 spot with her photographic journey down the Rhein River, Alles fließt.